Yeah you read that right. 10 minutes. First, prepare your spaghetti according to package instructions. Prefer penne pasta instead? Go for it. 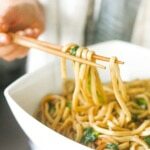 What about zucchini noodles? Go for it. You can use this sauce on ANYTHING. 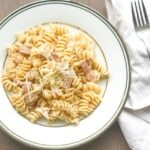 If you want to keep this dish gluten-free, make sure you use gluten-free pasta! The pasta will take about 10 minutes to cook. In the meantime, you can prepare your sauce. 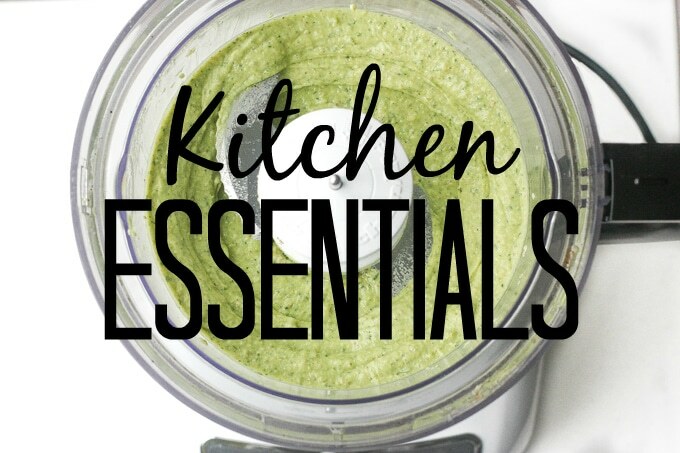 Gather your ingredients and place them directly into your food processor. Hit pulse or puree or high. Whatever settings your food processor needs to be set at that will enable you to blend those ingredients into a smooth, creamy mixture. If you don’t want to break your back bringing out your hefty food processor for this, you can even use a blender. When the pasta is done, drain it and place it back into the pot. 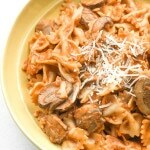 Pour your sauce into the pot of pasta and toss until the pasta is all fully coated. Serve immediately! You can top off your dish off with a few cherry tomatoes or some shredded Parmesan cheese (if you are not vegan). For extra protein, grill some chicken breast in advance and add it to your meal. Make some extra pesto and use it throughout the week. Remember I said that you can use this sauce on just about anything? Well, I wasn’t lying. It is amazing spread on toast or in your sandwich. You can also use it to make a quinoa salad. Just stir some into cooked quinoa and add some chopped tomatoes, cucumbers and kale and you are set for lunch. 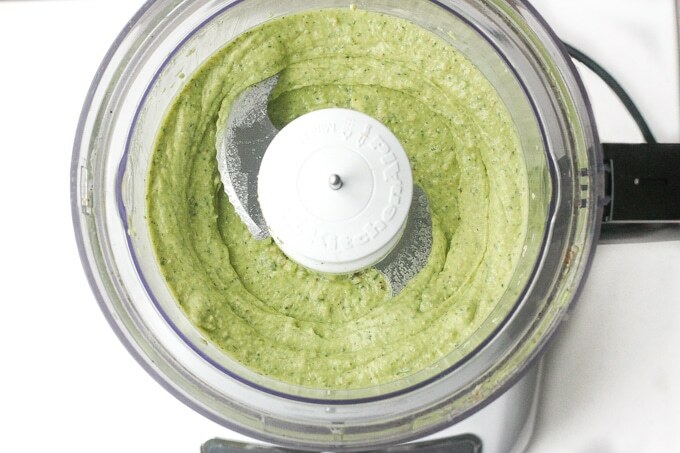 Tip: If you are making extra, make sure you store the pesto sauce in an air tight, sealed container. Since this sauce consists mainly of avocado, the sauce will change colour from its beautiful vibrant green to a dark olive colour. This is because avocado naturally browns. To prevent this, you can also store it with plastic seran wrap touching the surface to prevent any oxidization. 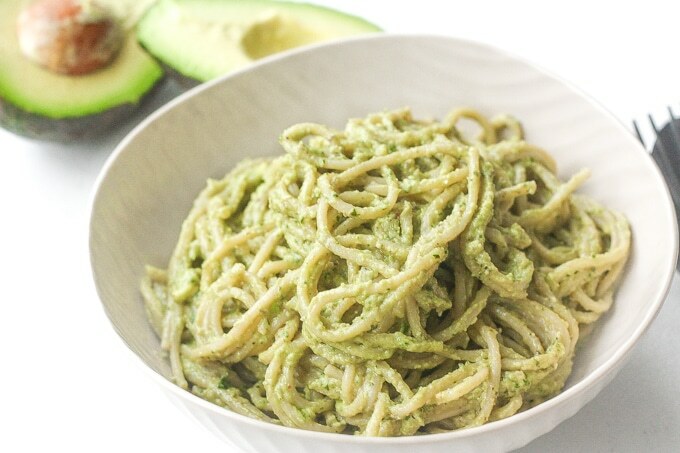 Treat yourself to the easiest vegan and super creamy avocado basil pesto spaghetti tonight. Ready in 10 minutes, you won’t know what do with your free time! Combine the remaining ingredients in a food processor and puree into a creamy and thick paste. Add to drained pasta and toss to combine. If you find the sauce to be too thick, add a little bit of water. Great recipe! 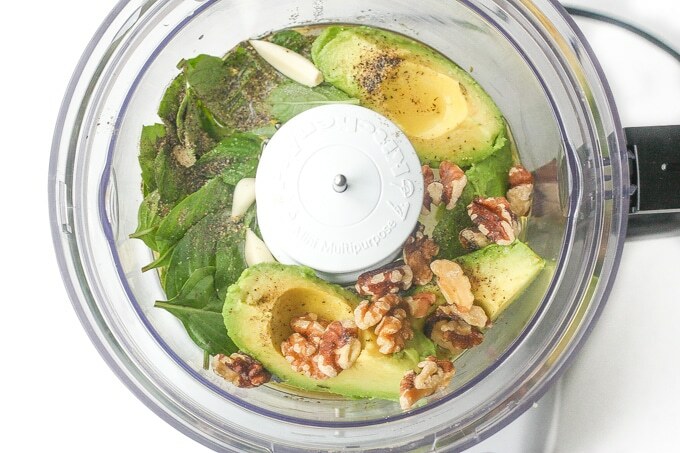 I added an extra hass avocado, fresh Parmesan, and substituted the walnuts for pine nuts.. DELISH! OH MY GOD !! I made this tonight and it’s amazing. My husband can’t quit saying how great it is and he’s trying to figure out what all he can use the pesto on. We are in the middle of our second Whole 30 and this was a fantastic addition to our meal plans. Sooooo creamy and delicious. We put it on spaghetti squash and dipped garden fresh cucumbers in it and licked it straight outta the bowl! We dipped our baked chicken in it, I may try it tomorrow on fresh tomatoes…..YOU MUST MAKE THIS. I did make 2 tiny changes -full disclosure- I did not have walnuts and used slivered blanched almonds instead. Also, I had 2 roasted garlic cloves left from a previous meal and used them instead of raw garlic. I can’t wait to see what else I can do with the 8 more avocados I bought today. I’m new to this site and have loved what I’ve seen so far. 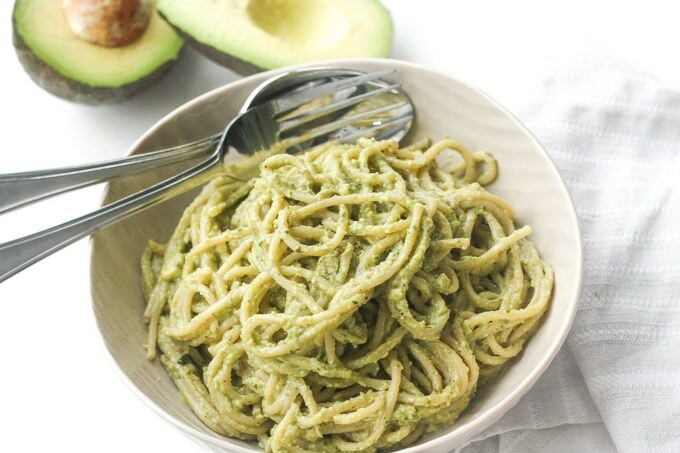 I made the Creamy Avocado Basil Pesto for our families Mothers Day dinner! It was delicious and a huge hit! We are a tough audience for new pasta dishes- we had an Italian restaurant, everyone except me is a foodie, and most of us prefer clean food. The dish look exactly like the picture and was creamy delicious! I’ll keep making more of your recipes! Thank you! I want to make this now OMG yum. That looks super delish! I love avocados!! I also love recipe posts that allow you to print them out!!! I love avocados and pesto. 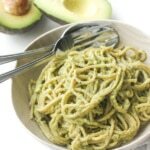 I have not yet tried a avocado sauce for pasta and I have to do it. You have inspired me. Fabulous looking pics in this post! What a cool recipe, too. Bet I could even swing it past my kids! What a great twist! First off avocados?! Yes please… but to turn them into your pesto sauce! LOVE IT! It’s nice to have simple meals to bang out through the week, but using the same 4 meals on rotation is going to have my family looking at me with udder distain. Adding this into the mix will definitely have everyone happy! 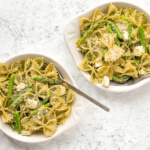 Creamy avocado on my pasta? This is so brilliant I cannot wait to try it! Thanks!! Anytime, Michele! I am glad you like the recipe! This pasta is something made in my dreams! YUM! I love that the sauce is so versatile too! I can’t wait to try it with some grilled chicken and Parmesan! YES!!! I am glad I made your dreams come true! 🙂 Grilled chicken sounds amazing on this! My boyfriend is a pesto-holic. He’s going to request this recipe every night from this moment on! Haha, well at least it’s super quick and easy! 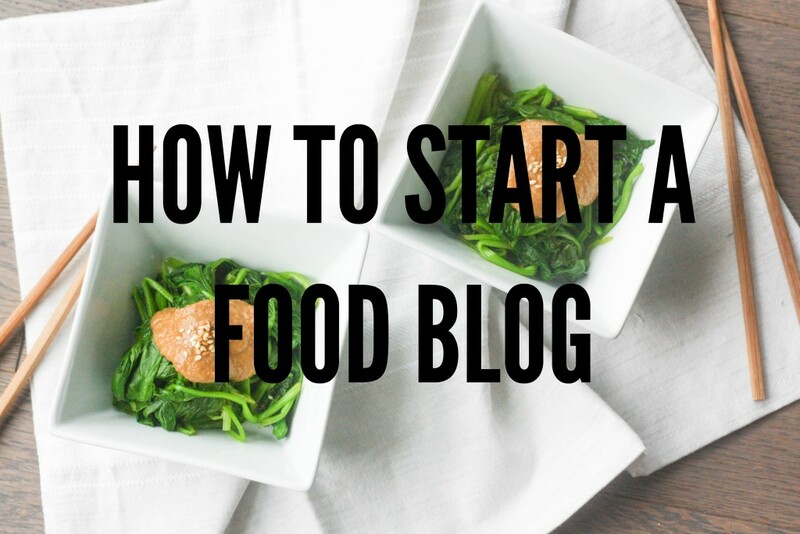 If you look at my blog name you already know this is the PERFECT recipe for meeeeeee! 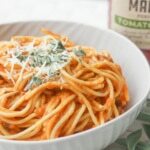 This sauce looks delicious AND versatile – a winner in my book! Thanks for sharing! LOVE this sauce on the spaghetti! Looks so delicious! 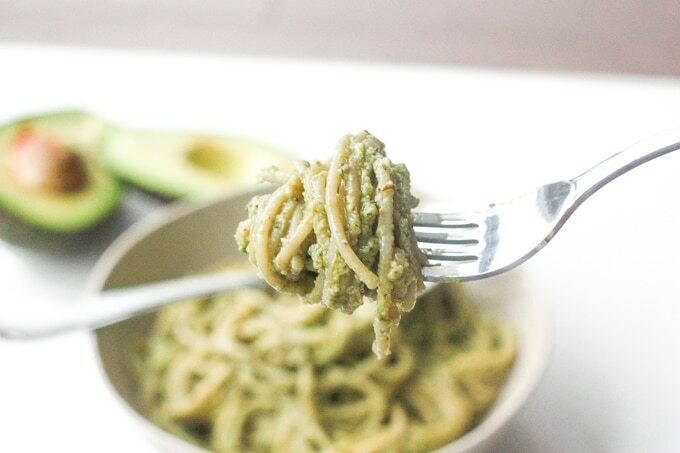 Never thought of putting avocado with spaghetti but this looks great, not to mention delice! Avocado is great! Makes the sauce super creamy! Oh this looks and sounds absolutely delicious! I love that it is a healthy, creamy sauce. Thanks, Shannon! I agree 🙂 You should try it! This looks so good! I looooove avocado. Oooh, sounds delicious! Definitely need to try this. Just don’t tell him it is so healthy and vegan/gluten-free 🙂 Let me know how it goes!